Thanks for this opportunity to share my photo with you and to entry the Pethouse Competition. 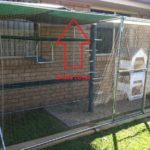 With an 8 metre length of the back veradah enclosed by Catmax with Clearnet, Ginger Rogers and I can enjoy the winter sunshine and the cool during summer without feeling enclosed. Ginger can access the area at anytime, with or without me. She can stalk the lizards outside the enclosure and the birds and other native wildlife are safe. 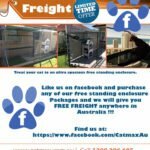 We love our Catmax enclosure and use it everyday.